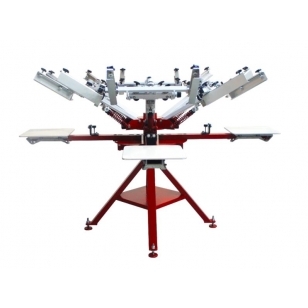 The Anatol Tornado manual screen printing press has the heavy-duty construction and easy-to-use, feature-packed design of our full size Lightning with a smaller footprint. 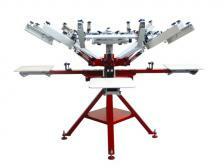 With a diameter of 8’2″ (249cm), the Tornado is our most compact manual press. Built for strength and durability while also being lightweight and ergonomic, the Tornado is a perfect entry-level machine for new screen printers or shops looking to add a manual press to their existing operation without a lot of space to spare. The side clamps are adjustable to hold 23″x33″ screens or smaller. When purchasing equipment with Visa, Mastercard, or American Express, your card will not be charged until you are contacted by our sales office with any shipping/crating charges, due to the size and weight of these items. PayPal purchasers will be contacted and charged separately off-line for shipping/crating charges, when applicable. You can obtain a freight quote prior to purchase by contacting customer service at 877-509-7600 or 480-858-9804. If you would like to investigate leasing options, click here.